Arlington Heights police and firefighter/paramedics responded about 2:13 PM Friday November 30, 2018 to a report of a power line sagging over the roadway at Central Road and Dwyer Avenue Arlington Heights, IL. Police and firefighter/paramedics arrived on the scene and discovered a power line sagging across Central Road just west of Dwyer Avenue. Exelon brothers of ComEd from Atlantic City Electric in Atlantic City, New Jersey responded to the scene to repair the line and assist hard-working and dedicated ComEd crews while the ComEd area was in storm recovery mode. 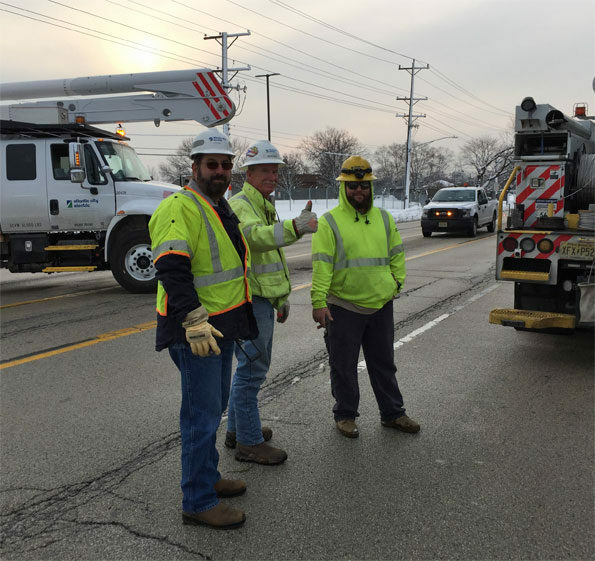 Atlantic City Electric Crew in Arlington Heights with a thumbs up after a big thanks for traveling to Arlington Heights to help ComEd.